Make your social encounters come alive with new surprises and tactics! This beautifully illustrated 52 - card deck gives you a great way to run courtly intrigue and tavern showdowns in your Pathfinder Roleplaying Game campaign. 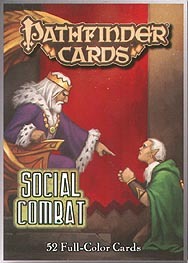 Whether you're using deception, wit, or intimidation to get your way, this deck presents complete rules for extending subtle and devious conflicts, jump into the drama and dominate the scene with Pathfinder cards: Social Combat.